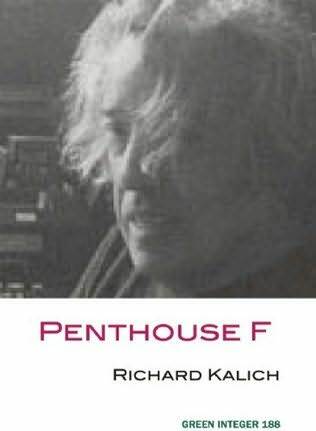 I just finished reading Richard Kalich’s Penthouse F, which is brand new from the always provocative Green Integer. I was surprised to not have previously heard of Kalich despite his three previous books having been lauded by Brian Evenson (“Kalich is after what it means to be profoundly out of step with one’s culture yet still unwilling to let go of the American dream”) and various fantastic others. As soon as I opened the book just casually after having gotten it in a stack from the mail, I found myself compelled to start reading it posthaste, as the way the book is set up, as a mishmash of interviews conducted in a trial, documents pertaining to said trial, and the author’s personal interjections, it was clear that this book is of the kind that once you start you just want to keep reading both to find out what happens, and in this case, the strange way it makes what happens work. I’ve since bought everything else by Kalich I can find (nameably The Nihilesthete (1987) & The Zoo (2001) & Charlie P (2005)). The main meat of the proceeding involves the author himself, and what becomes an increasingly strange question as to the nature of his work. The book opens with a series of notes the author had scribbled years back re: the creation of the book itself, and leads therein into an investigation of said proceedings: which directly involve the author’s implication in the matter of a suicide by a young man and woman who had come to live with the author, and then decided to jump to their death from his apartment’s window. The trial, then, is of the author, wherein the question of his involvement in those deaths is being examined, particularly seeing that the literary work he’d been directly mirrored the relationship with the boy and girl, and in fact, gives his story, on paper, as a reflection of life, an end. A question then as to the author’s responsibility for his arrangements and imaginations, as well as where the line between fantasy and reality is drawn, is processed through his character, his actions, and his work. The voice is black and inwardly sexual, grasping at something, getting a piece of it, but what piece, and still being there, with what taste for it, and what now, and now. Much of the proceeding takes on a Sisyphean kind of angle, a wretched process, though delivered here in easy to parse, and even addictive description and proceeding, making it not a roll in muck, but a grim mirror. What results, then, spirals hard. As more and more questions pile upon questions, and who did what and why and who does it hurt and what is right or wrong, there is some kind of sprawling silent presence among the pages, unnameable really, but undeniably there. In the strange, sometimes frank ways that Robbe-Grillet and Cooper and Acker approach a kind of lurking moral presence in their work, Kalich too creates something somehow both spiritually clouded and passively demanding: what is going on here, in this business of words, and people? The answer, perhaps both political and existential, whether you agree with one side or the other, operates in the way texts I most often enjoy to get wrapped up in invoke: a door that once opened, is opened, and you can’t get it all the way back shut, try how you must. This is a book, a body of work, an author, deserving a new unearthing eye.